Amidst raging controversy on how "tame" was Times Now interview with Prime Minister Narendra Modi was, especially when it was taken by its aggressive editor-in-chief Arnab Goswami, a well-known Dubai-based journalist has revealed that arranging an interview with Modi is a "long drawn and cumbersome process", ending up with a "handshake" and "a written script" prepared in advance. Boby Naqvi, who met Modi ahead of the latter's United Arab Emirates (UAE) visit for an interview with "Gulf News", giving a first-hand experience of his meeting with Modi on August 16, 2015 in a Facebook post, says he had requested interview on bilateral relations between the two countries and India's role in the Arab world. After he applied for an interview with Modi, Naqvi says, he received news from a foreign office bureaucrat that the interview was “arranged” in the presence of “two other publications”, Naqvi says, "I had no option but to grudgingly accept it." Saying that he though he received “several requests for security clearance” about the name of the driver, car registration number, the photographer's details, etc., Naqvi adds, "Till the last moment I had no clue about the venue and time of the meeting." "All I was told was that it could be anytime after his Red Fort speech on the Independence Day. After frantic calls on August 14, I was given the phone number of my point of contact in Delhi. This person asked me to be in the capital before noon and said the exact time and venue would be provided later", Naqvi says. When he was about to board the flight on August 14, Naqvi says, he got a "strange phone call" from a prominent Muslim personality, considered close to the PM, revealing that he knew of the interview, “even though he is not part of the government”. On reaching Delhi, he was told his photographer “would not be allowed and that pictures would be taken by the Prime Minister's official photographer." But when he decided to put his foot down, a few hours later the photographer was "allowed" on the condition that he would spend only five minutes inside. Driving down on the rainy day, "at the first checkpoint at 7 Race Course Road we faced another trouble. A huge flashlight almost blinded us when a heavily armed man in a raincoat approached the car. The sound of heavy downpour made it impossible to hear him. All he could understand was that we are 'from Dubai'," Naqvi says. After security checks, his card was escorted inside. On reaching the spot, he says, “an officer again took our details and radioed them to his superiors inside the office-residence complex. After several minutes, he said the photographer had no security clearance.” But after some hassle, they were “allowed inside". On reaching in, a PMO official told Naqvi, "After photos and handshakes, the prime minister will look at you, and then you start your conversation", adding, this was followed by "another shocker... that I can ask only one question and answers to my remaining questions would be provided in writing after the meeting." Naqvi says, "The meeting went as per the script. 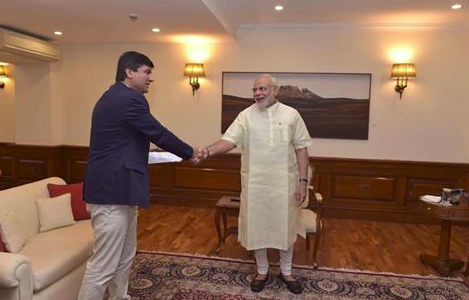 After a warm handshake, we spoke in Hindi about my late night flight and his Red Fort speech earlier that day. Another journalist who was scheduled to speak next (he came from US and picked up a gift for the PM from duty free) spoke in English via a translator." "An hour or so after the meeting was over", Naqvi says, "I was given printed transcripts of the conversation and answers to my questions that I couldn't ask." Naqvi comments, "I wasn't surprised when I read that questions for Times Now interview were sought in advance and that the interview was scripted." He is a fake prime minister as the whole world knows. And Indian media is so coward, they won't dare to ask him about his role in supporting RSS, VHP, Bambang dal and other Hindu terrorist organisations. This is the procedure followed by bureaucrats for most Head of States. Nothing new in the case of NaMo. Being a popular leader by a fair distance in the country, he attracts unwarranted controversies.